"STEREO" on bottom of label. Comes with a regular inner sleeve. With the exception of the production credits on the labels any further credits are missing. Anyone know anything else about this release? I think this is the version I have. Mine has R 2180 in the runout, and MX173370 on the label. The cover is plain white on the inside, not printed, with no barcode. Is it an official release, or a bootleg? I bought it new for $20 about a week ago. The Red vinyl has production flaws (pits and bubbles and challenging tracking) and is fairly light/thin. Sonically warm, but with unfocussed bass and quite lacking in detail and presence compared to say the reissue (remastered?) of zuma. Unfortunately unable to compare to original US pressing. 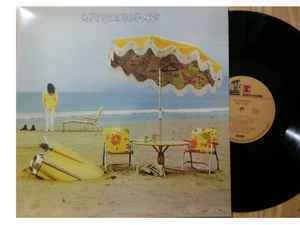 But hey - it's still on the beach on vinyl.